How an introvert born to immigrant parents from Cuba found his voice and learned to create a space where he constantly recalibrates to keep himself balanced and his priorities straight. In this interview, we learn how an astute reader and lifelong learner with an ever-evolving leadership style, keeps his sense of community and family at the forefront of everything he does. He has arguably the best job at one of the world’s most valuable sports brands. 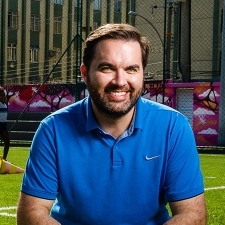 Jorge Casimiro is the Vice President of Global Community Impact at NIKE, President of the NIKE Foundation and an alum of the CHCI Congressional Internship Program. During a recent visit to Washington, D.C., he sat down with the VLI to share his thoughts on leadership, community impact and his experience growing up in tight-knit, predominantly Latino neighborhoods in the Tri-state area. An experience that fuels his passion for making the world a better place for the next generation, including his three young kids. VLI: What book are you currently reading? JC: What you’re reading depends on the different stages in your life and the things you might be focusing on at that moment in time. For me for example, one of the first thoughts that comes to mind are my kids. I have three young kids: a daughter who is seven years old and two sons who are five and two. And one of the first books that comes to mind is Good Night Stories for Rebel Girls. And it’s a book that I read both to my daughter and to my sons. Because I want them to hear stories about amazing women who have done incredible things. About women who have accomplished incredible feats throughout history. VLI: What book do you consider a must-read for young leaders? JC: When I think about my leadership and my leadership style, for example, it’s something that I take very seriously and something that is ever-evolving. The kind of leader I am today is different from the kind of leader I was five years ago or 10 years ago. And it will be different five years from now. We should always be trying to improve upon what we’re doing. So, the concept of learning is very important when it comes to what we’re reading. I just put down a book recently that I read on a flight, it’s called Leadership and Self-Deception. It’s a fascinating book because it really invites you to question what kind of leadership style you have: How do you take in information? How do you engage other people? It’s important to always be on your toes. To always consider that maybe you can do things in a different way, and maybe there are different ways to ask a question. Different ways to engage an audience. That book to me is a very powerful reminder of that. And it’s one of those books that I will pick up every few years and re-read, because it’s a good reminder. One book on leadership that I’m currently reading is Blindspot: Hidden Biases of Good People. It’s another one of those books that invites you to question. We’re not perfect and we can always do better. For me and my leadership style, these are the kinds of books that help create that space for you to reflect and think about your own style and what you can do to improve on it. VLI: How does your upbringing contribute to the kind of leader you are today? JC: When I think about my upbringing – my parents are immigrants from Cuba – I think about community and family. The sense of community and family has always been very important to me growing up in New York and in New Jersey. We always lived in neighborhoods that were majority Cuban or majority Latino neighborhoods. Neighborhoods where you were there for one another. When I think about my career, I think that community has always been a part of that. It’s been about how do we work together to make change. It’s that desire of wanting to make a better place for your kids. That background of paying it forward, making an impact, thinking about how I can make this world a better place for the next generation. VLI: Can you talk more about what family and community mean to you? JC: Family dynamic is about community. It’s about being there for one another. It’s about caring at the end of the day. There’s a civil rights leader in Oregon who spoke to an audience I was a part of a few weeks ago and she reminded us that at the core of community is caring. Caring for one another. Caring for the next generation. That’s absolutely important. The other thing, too, is the desire to improve. The immigrant experience, the American dream, coming to America and having all these incredible opportunities and wanting to build so that your kids can have something that you didn’t, and their kids can have something that they didn’t. That resiliency and being relentless. The concept of a strong work ethic. I think about what my parents would tell me, ‘Work hard, keep your head down,’ certainly something that resonated with me. As I worked hard in school and in my jobs. That part about keep your head down is where I had to learn to adjust. I had to learn to find my voice. I had to find my confidence. Madeline Albright has a great line about learning to interrupt. Learning how to engage. Knowing how to ask questions. Knowing how to make sure that you’re speaking authentically. And that you’re speaking with the purpose of advancing a vision. Quiet: The Power of Introverts in a World That Can’t Stop Talking by Susan Cain. That’s who I am. Sometimes people are surprised that I’m an introvert. It’s a personality type. It hasn’t stopped me from finding my voice and using my voice. it’s great to have that space and advancing a cause. VLI: How do you find balance in your daily life? JC: To me, having kids was a real turning point in my life. You have to take moments in life to recalibrate and reprioritize what’s important to you. There are only so many hours in a day. And you have to stop and reflect and recalibrate on some of those priorities and what the tradeoffs are going to be. Because all of a sudden, there’s something more important, you know – my daughter, and my son two years after that and my other son three years after that. And what needs to change in my life based on my priorities. If my priorities were the same today as they were when I was 25, I probably wouldn’t be a great dad. I probably wouldn’t be very happy in my professional life. You’re not going to be successful as a leader, unless you’re happy and fulfilled in your personal life. VLI: What advice would you share with young leaders? for young people. We forget that about ourselves. And I think it’s important to realize that and emphasize that with young leaders. VLI: What do you see as one of the greatest challenges young leaders face today? JC: When I think about young Latino leaders today, they have all this information coming at them. Information from all different sources and all different biases. There’s a lot that the world needs right now. Whether it’s political. Whether its socioeconomic. Whether its geopolitical. There is a lot and there always is. What’s really, really important, is that they take time. That they create that space that I was talking about before. That they use that time to really reflect on a couple things: First, be very clear about what it is you are trying to get after. I find a lot of times we go after everything. While that might work in some situations, it’s not a sustainable model. As an individual, what is that clarity about what it is I want to get after? Second, under the umbrella of taking the time to reflect, where are you in your life? Think about where you are and learn. Learn about the particular cause or issue. And not just from the way you’re looking at it, but consider other points of view as well. And don’t easily dismiss other points of view. Really learn how to engage and listen. At the end of the day, we are trying to make an impact for everybody. Not just for one group of people. For kids everywhere. For the next generation. So thinking through where is the clarity and vision. Learn how the different systems work. If it’s politics, learn how politics works, learn how public policy is conducted. Learn about the issue. Learn about other points of view. Think about a holistic and integrated way forward. Compromise where you have to. Compromise is not a dirty word. And then get after it. Be very deliberate, be very intentional, and get after it. VLI: What is your role at NIKE? JC: Very simply, I think I have the best job at NIKE. If we look at NIKE’s mission statement, I think NIKE’s mission statement is one of the most powerful mission statements that exists in the world today: “To bring inspiration and innovation to every athlete* in the world.” And importantly, there’s an asterisk on the word athlete. And it says for the asterisk, “If you have a body, you are an athlete.” I think that is such a powerful statement about how NIKE views its existence. Because for NIKE, CSR, social responsibility, community impact, whatever phrase you want to use, it’s not just something we do. It really is who we are. It really is embedded in the culture and the DNA of the organization. It’s been that way since day one. In my role, what I get to do is channel those passions from our employees. Channel the authenticity we have with our brands around a social cause. Something that’s authentic to who we are. So what we do is ‘Made to Play.’ It’s our ongoing commitment to getting kids moving, getting them active – to live happier, healthier more successful lives. Because research will tell you, if you want to get the world moving again, you have to start with kids. Specifically, kids in that elementary school age is important. And just playing with them. We are not talking about organized sports. We are talking about play and fun and getting them moving. So what I get to do is connect our employees and our brands with partners to bring to life our company’s greater purpose and to bring to life our mission statement to communities all over the world. VLI: What do you consider a good day at NIKE? at my office, I have pictures of kids from our programs from all over the world that inspire me. Because I look at those pictures and I see those kids and I see them smiling. So, to me, it’s not just a good day, it’s great day when I get those notes and those photos. And I share them with the team. Someone’s got to be there for these kids. We fundamentally believe that every kid has potential. What every kid doesn’t have is the opportunity to unleash that potential. So, what we’re doing through ‘Made to Play’ is tapping into that potential. Giving kids an opportunity in a way that is very authentic to who we are. That plays into what we know how to do, which is to bring inspiration and innovation to athletes around the world. VLI: What kind of impact did participating in the CHCI Congressional Internship Program have on you? JC: I did the CHCI program in 1994 and to be honest, I hadn’t stopped to reflect so much on it until the last couple of years. I did the summer in between my senior year in high school and my first year at Brown University. I had grown up in neighborhoods that were majority Latino and majority Cuban and unbeknownst to me at the time, I was about to go to college where I was no longer going to be in the majority. The CHCI experience, what was really meaningful, is that it provided that bridge in what it was like to live in a majority Latino community and a not majority Latino community. I was able to do it with other interns, about 20 or 30 of us, that were going through that experience at the same time. So, it helped bridge those two different environments, those two different experiences. That really set me up for success at Brown and obviously beyond that. VLI: Was there a particular experience during your internship that had a major influence on you? JC: Yes, I was going through the program and was learning how things worked there in Washington, DC. Here I was, all of a sudden, in our nation’s capital. And you see how our country works. You see how government works. You see how laws are made. You see how things are adjudicated in the Supreme Court. You see what the role of advocates are. You see what all the different players are that have a piece in it. Learning how something happens. Learning how systems work. I think it’s so important. In hindsight, that was the first place where I actually saw that. How something happens. If you’re going to get after it – whether its education or healthcare or immigration – pick your cause, pick your leadership. Even in business, understanding how a business works, how a corporate environment works. Where everyone has a different culture. The first summer that I came here was the first summer that it was acceptable for women to wear pants on Capitol Hill. And that was a big thing back then. It’s absolutely incredible to understand and learn why things work and how they work. Because if you are going to effectuate change, you have to understand that. Another aspect was meeting all of these government officials – whether they were members of congress, cabinet officials, whatever the case might be – and realizing that they were human beings. It wasn’t just a name that you see on TV. Or a name that you read in a newspaper. Or a name that you read in an encyclopedia. Because that was the one thing that I had in my house, was Encyclopedia Britannica. But that they’re people. And that they’re people like me and you. and I could see myself doing those things. And especially because we had Latino members of Congress that we were meeting with. And Latino officials in the administration. And all of sudden, you see someone that looks like you, you see someone that sounds like you, you see someone that likes the same kinds of food that you do, the same kind of music that you do, and all of a sudden it becomes more realistic and more attainable to think, ‘Yeah, I can do this, too.’ And that is such a powerful piece when we talk about young leaders. Young leaders need to see that there are others out there. And they need to see themselves in those other people to have that confidence.